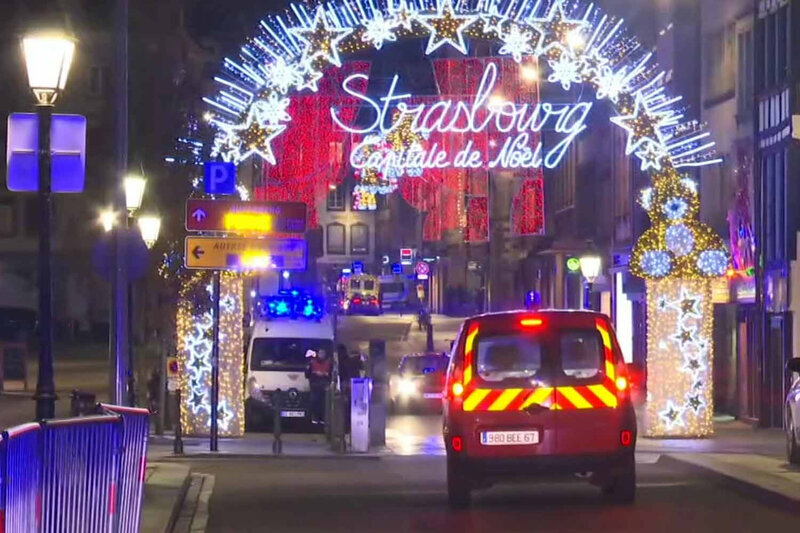 The terrorist attack of Strasbourg (France), on December 11 2018, was an illuminati false flag. The people say that this false flag aimed to stop the Yellow Vests protests, but this is a blatant lie and a huge manipulation... the objective of this false flag is the exact opposite. Both the Yellow Vests movement and the Strasbourg false flag are the pure creation of the illuminatis, so it is non sense to say that this false flag was to stop the Yellow Vests, as the illuminati fully control this movement and are the ones who are fueling it. In fact, this false flag serves the exact opposite target: to push the Yellow Vests movement into a new phase, a much more violent and chaostic phase, in order to export the chaos all over the world. Order out of chaos, this is the motto of the illuminati, they have to generate chaos in order for the people to welcome the New World Order with open arms. This staged Yellow Vests movement is to deceive the whole world, the illuminatis want the people to think that they have overthrown them and that the power now belongs to the people, but this is only a huge deception and a manipulation, the truth is that the power of illuminati remains fully unaltered. The fact that this False Flag was in Strasbourg, the capital of Europe, the illuminati headquarters, represents a major symbol... the illuminatis want to send us a message: that they will now pass to very serious stuff: world chaos and nuclear world war 3, which will represent the advent of their Luciferian New World Order, the Regn of their Master, the Antichrist. The fact that Trump has now left Syria indicates the beginning of a new operation in the middle east, certainly the beginning of the war against Iran, or a new major crisis in the area. The illuminatis have to orchestrate chaos and death all over the world, it is the necessary step for the New World Order, this is what is coming in the very close future. You have to stay alert and not to be deceived. The illuminatis control the religions, the governments, the medias... the only way for you not to be deceived is to count on God Alone... not religions which have become mere sects created by Satan, not your clergymen who are mere puppets between the hands of Satan, if you listen to these people who are blind and lost, they will lead you to hell with them. I am God's messenger, the sole and only one, I am God's warner for the end times. I am warning you about these deceptions: The staged world chaos, ww3 ... do not involve in any of these conflicts, do not be deceived with the propaganda around it, these events are the pure deception of the Devil. Then do not be deceived by the Antichrist, do not be deceived by the Imam Mahdi, do not be deceived by the False Jesus who is coming...these 3 figures will come and will match to your prophecies....except that these prophecies have been forged by Satan himself in order to deceive you. There is no warner for the end times other than myself. God has sent me to warn you that the end of this world is now very close and that you'll see it during your lifetime, God has sent me to tell you that your sole and only way of salvation is by putting your hope and your faith on God ONLY, and by following his ultimate book, the Quran (which has nothing to do with the practice of the satanic sect called islam). God has charged me to restore his One True Unaltered Religion for you, because it is the only way for you to be saved from the horrible events which are about to happen. This religion is very very very simple: to take only God as your sole and only Guide and Savior, and to follow what is clearly written in the Quran, to repent from your sins, to stop running behind this terrestrial life. Leave these sects (Islam, Christianism, Judaïsm) that you call religions, they have been engineered to lead you in the hands of the Deceiver, and they are the religions of Satan and not the Religion of God. I warn you with insistance that the coming 3 figures: the Messiah of Israël, the Imam Mahdi and the False Jesus, will be 3 deceivers driven by Satan himself...be warned, that if you follow them, you'll be destroyed in this life and you'll receive hell forever in the hereafter. Follow my website and my Youtube Channel, stay alert, follow my advice from God, this is a very very serious message.